When gore and interior design combine forces, it makes for very interesting graphics. Thanks to Iron Dog Studio we all now get the chance to see just what that combination can bring us. 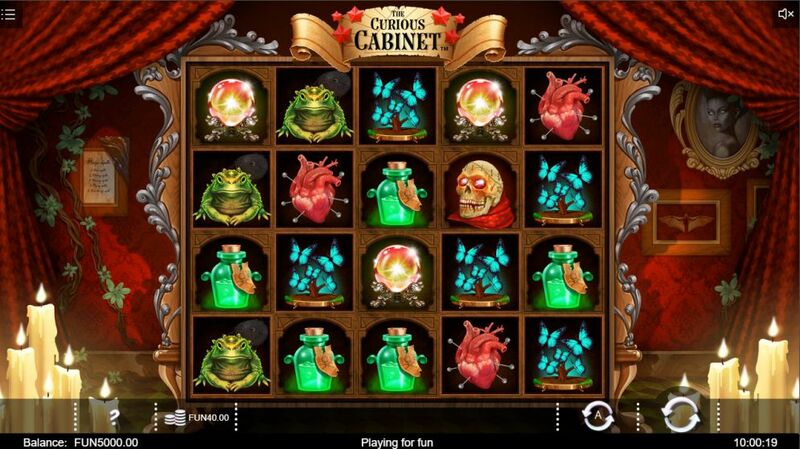 Open the Curious Cabinet if you dare, but watch out for the severed heads, hearts and more. Luckily though there is lots of nice things hidden away in the cabinet too, you just have to find them! 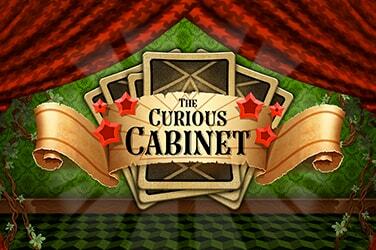 The Curious Cabinet is a 5-reel, 40 fixed pay line slot that offers all who dare enter an RTP of 96%. Looking like something straight out of a horror movie, the reels are set inside a cabinet style design. Gruesome pictures sit on the wall behind and lush velvet curtains in blood red are draped on either side. All the symbols have a gore/pretty theme, which seems like an odd combination, but it works. High value symbols are represented by the wooden jewelled cane, skull with glowing eyes and a vial of poison. With lower value symbols are represented by a crystal ball, a toad, a dismembered heart and a butterfly tree. There is a very eerie track playing along which certainly adds to the spooky feel of the game, alongside interesting sound effects like the toad croaking and watch out for the spooky scatter symbols sounds. Bet Amounts – Betting on the Curious Cabinet begins at 40p per spin and can be raised up to the highest stake of £50 per spin. To adjust your bet, you need to click on the bet amount found at the bottom left of the reels. It will give you the option to select max bet which instantly increases it to the £50 amount. Alternatively, you can switch between the minimum and maximum bets by using the arrows either side of the bet, until you are happy with your selection. Wild Symbol – A red rose is your wild symbol on the Curious Cabinet and it will substitute for all other symbols except the two scatters and the bonus. Wilds can appear on any reels within this game, meaning a much bigger potential of forming winning combinations. It also plays a vital role in the bonus spins too, where it becomes an expanding wild for that round. Scatter Symbols – The Curious Cabinet has not one, but two spooky scatter symbols. One is an off putting doll symbol, enough to give you the jitters and the second is a monster! These symbols expand on the reels and once they do, they offer separate ways to land scatter win prizes. Bonus Symbol – Your bonus symbol is a drawer with a silver handle on it. This symbol will only land on reels 2 and 4. Land a single draw for an instant prize, but land 2 drawers to trigger the bonus spins round. Doll / Monster Scatter Feature – Having two scatter symbols in play gives bigger win potentials for players. Both of the scatter symbols will appear stacked on the reels but will occasionally land as a partial symbol instead of a full stack. This doesn’t have a negative impact on the achieving of scatter wins, in fact it enhances your chances instead. The monster scatter – lands as a 1×2 symbol initially but land 4 single parts of the monster on the reels to turn them into 2×2 complete symbols. Scatter wins are paid out for landing just 4 parts of the monster anywhere on the reels. Your wins are paid out for landing from 4 to 15 symbols, offering x40 coins for 4 and x40,000 coins for 15. Silver Draw Bonus Feature – Land just one silver draw bonus symbol on reels 2 or 4 to trigger the instant random feature. You will now receive one of the following listed prize wins. an empty draw meaning only line wins are awarded. Silver Draw Bonus Spins Feature – If you land 2 silver draw symbols on reels 2 and 4, this is where the fun begins. Instead of receiving the instant bonus, you will now enter the bonus spins round and be allocated with 8 spins to play through. During the bonus spins you will now have gold and silver draws below the reels. These draws will change at random below the reels but each one will contain a prize. Gold Draws – offer either a x5 multiplier for any wins or a cash prize to be added to the line wins. Silver Draws – offer a x2 multiplier on line wins, a cash prize to be added to the line win. On each spin one of the draws will open to reveal a prize for that spin only, but you will open a new draw on every spin. All wilds are changed into Venus flytraps and become expanding wilds landing on up to 3 reels at any one time. The Curious Cabinet is a must for anyone that enjoys extra features, as it is packed to the brim with them. Having two scatter symbols and a dual-purpose bonus symbol means there is lots going on, so we hope we have made it easier for you to follow. Iron Dog Studios has taken the horror theme and tweaked it somewhat, making it appealing to all. With all these extra ways to win you will find there is lots of smaller wins flying through, though landing the bonus spins feature is harder to do. Once it does trigger however there is big money to be made, with the addition of the prize draw opening on every spin. For anyone wanting to play a quick game or a long game the Curious Cabinet will appeal for both, but be prepared to be playing some time before that bonus spins triggers.